Note: Rock Island has not yet posted the catalog for this auction – I will replace this note with a link when they do. 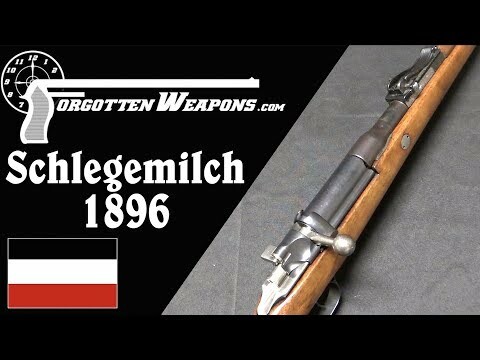 Louis Schlegemilch had been one of the contributors to the Gewehr 1888 and when the German military decided to replace it, Schlegemilch was there with a design he hoped would win. His model 1896 rifle was a two lug bolt action design with a number of clever machining details, and a distinctive massive shroud covering the bolt. The rifle was chambered for the 6x58mm cartridge and was tested from 1896 to 1898 against Paul Mauser’s best design. Schlegemilch ended up losing the trials, and aside form a few rifles made for the hunting use of German aristocracy, the design never saw further production.